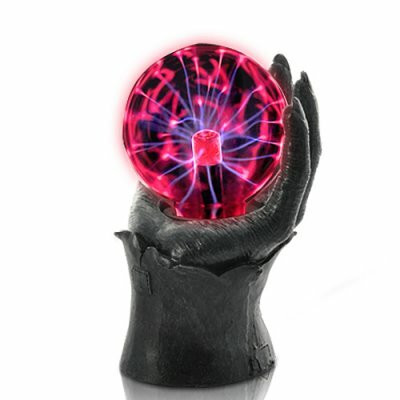 Successfully Added Grasping Hand Plasma Ball with Touch Response (110V US) to your Shopping Cart. Halloween Grasping Hand Plasma Ball with Touch Response - your Halloween decorations aren't complete until you have a few of these eye-catching plasma globes hanging around. Just connect the power plug and watch as the streams of plasma dance inside this Halloween Grasping Hand Plasma Ball. The constantly moving blue and red colors have been looked at (and admired) by people all over the world, and now it's finally your turn to add this visual masterpiece to your inventory of cool Halloween gadgets. Place a few around the house during that big upcoming Halloween party and you'll find that crowd-pleasers come in all shapes and forms. That's not all though, this plasma globe certainly is mesmerizing to look at, but it's even more fun to play around with! That's right, much more than just a beautiful decorative gadget, this Halloween Plasma Ball actually reacts to your touch! Run your fingers along the outer surface and watch as the electricity follows your every move with a bright, harmless, and cool blue lightning effect. This Halloween Grasping Hand Plasma Ball is available in our warehouse now for single or bulk orders. But be warned: Due to limited stock, once this item sells out, we will not be restocking. So get your orders in now!